A home printer is great to have. But is there anything more annoying and expensive than having to replace ink cartridges all the time? I had enough of that hassle, for my home office, I looked into printers that are ink efficient. After extensive research and testing, I came up with this list of the best printers for home office use. Before you buy a printer, it’s important to know just what you’re getting. We’ll be looking at a variety of options here, including compact printers, multifunction printers, and both inkjet and laser printers. All of these printers offer reliability and decent ink efficiency. This printer offers excellent ink efficiency by getting rid of the ink cartridge concept. Instead, it has an ink tank – a “supertank” to be exact. The printer comes with plenty of ink pre-loaded. There is enough ink to print up to 4,000 pages in black and 6,500 pages in color. That’s equivalent to about 20 ink cartridge sets with a typical printer. Ultimately, this model of printing saves you money and the value is especially high if you have high demand printing needs. When you run out of ink, it’s easy to refill with affordable replacement ink bottles. This can ultimately save you around 80% on the cost of ink. The ink efficiency is definitely this printer’s strongest selling point but it has a lot of other things going for it as well. It’s quite compact, making it a good option if you don’t have much room. An all-in-one solution for printing, scanning, and copying, this is a robust tool that would work well in both home and business settings. This printer has built-in wireless. In addition to printing from a laptop or desktop, it’s also easy to print from a smartphone or tablet. Verdict: This printer stands out for offering the height of ink efficiency, resulting in major savings over time. The Epson Expression ET-2650 EcoTank is the best printer for home office. Especially for businesses, sometimes the only ink you need is black. This laser printer from Brother offers only black and white printing. Everything about this printer is focused on productivity and efficiency. It features a 250-sheet tray and a 50-sheet automatic document feeder. If you print a lot, this saves you time since you won’t have to refill the tray as often. There is also a manual feed slot for different kinds of paper and materials, ideal for things like envelopes and card stock. Another way this printer saves time is print speed. It has an industry-leading print speed of 36 ppm. This printer offers a variety of connection options, including Ethernet, USB, and WiFi. In addition to saving you time, it can save you money. It has automatic 2-sided printing. There is also a special mode that cuts back on the amount of toner used. When you use the Amazon Dash Replenishment system, you’ll automatically order more on Amazon, meaning you’ll never run out of toner at a crucial moment. The high-yield replacement toner will consistently print 3,000 pages. A full-fledged business solution, this printer also scans, copies, and faxes. Verdict: The Brother MFCL2710DW Monochrome Laser Printer is a great printer for a business or a home office, as it offers fast B&W printing as well as flexibility and convenience. This affordable all-in-one printer is built to last, with a 20,000 page Duty Cycle. It’s designed to handle big home offices jobs, with a 500-sheet paper capacity via two 250-sheet paper trays. Duplex printing is automatic, helping you to save money on paper. The print speed is quite fast, at 24 ipm for B&W and 15.5 ipm for color. The Dual-Resistant High Density (DRHD) Ink System results in sharp text and vibrant graphics that are highlighter and smudge resistant. It’s easy to monitor the ink levels in the XL tanks so you know when you’re running low. With a low cost-to-print ratio, this printer and ink system will save you money over time, especially if you tend to do a lot of printing. There are a variety of connection options, including Ethernet and USB as well as wireless options. The Canon PRINT app allows you to copy, scan, and print right from your mobile device. You can also use AirPrint and Google Cloud Print. Some additional features include the ability to set security restrictions and the ability to view Records of Use to keep track of how the printer is being used. This may help you reduce waste to further lower costs. Verdict: The reasonably priced and eco-friendly Canon Office and Business MB2720 Wireless All-in-one Printer offers convenience and can save you time and money. Another printer excellent for business use, this all-in-one color printer from Brother is designed with efficiency in mind. It has a 250-sheet capacity paper tray and a single-sheet bypass tray for special paper types. Duplex printing is automatic, saving you paper. There is an auto document feeder that lets you scan and copy unattended with a 50-sheet capacity. The inkjet printer produces sharp text and vivid color graphics. Super High-yield replacement ink cartridges save you money on ink in the long run. Ordering new ink can be automated with the Amazon Dash Replenishment system. Connection options are varied and flexible, with the option to print wirelessly from your mobile devices. You can use the touchscreen to access and scan directly to popular cloud services like Google Drive, Dropbox, OneNote, and more. Verdict: Brother has long been a leader in the printer market and the Brother MFC-J5330DW All-in-One Color Inkjet Printer is another example of why with its focus on efficiency and convenience. This compact printer only does B&W printing, making it a good choice for a lot of business users. With efficiency in mind, this printer can print up to 32 pages per minute. It features a 250-sheet paper capacity and can handle both letter and legal sized paper. Automatic duplex printing can save money and time. When you run out of toner, the high-yield replacement cartridges you can purchase will ultimately save you money with higher print volumes for lower costs. Ultimately, you can expect 3,000 pages from each cartridge. This is another printer that is Amazon Dash enabled so buying toner when you are running low can be a convenient and efficient fully automated process at home. You have a few different connection options, including USB and WiFi. Verdict: If you’re looking for a monochrome printer and you don’t need copy and scan functionality, the fast-printing Brother HL-L2350DW Compact Monochrome Laser Printer is worth considering. Looking for a low-cost printer that can do it all and offers good ink efficiency? This printer from HP is definitely worth a look. It’s quite compact yet offers high-performance output on par with more expensive printers. It’s an all-in-one device with copying, scanning, and faxing in addition to printing. Wireless printing is available, including AirPrint for printing directly from a mobile device. This printer is Amazon Dash Replenishment enabled so you can automate the ink-buying process. Alternatively, you can use HP Instant Ink where you pay for pages printed rather than the total ink used. This unique system allows you to save up to 50% on the cost of ink. Verdict: The affordable HP OfficeJet 4650 Wireless isn’t perfect, but it has a lot to offer as a compact, all-in-one printer with different options for staying on top of your ink levels. For bigger businesses, there is usually a real workhorse of a copy machine that can often also print and scan. More often than not, that machine is made by Xerox. 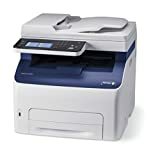 For the small business or home office, you can bring in some of that workhorse sensibility with this much smaller Xerox model. With a Duty Cycle of 30,000 pages, this device is built for the long haul and it’s designed to work hard. The paper tray holds 150 sheets while the document handler can take 15 sheets. You can go wireless with WiFi or connect using Ethernet or USB. It’s not the fastest printer on this list but it is pretty fast, with speeds of 18 ppm. Full-color prints are printed in 13 seconds. Off note, the scanning and copying functions on this machine are more robust than you’ll see on a lot of the finest all-in-one printers. You have more options and ultimately can get better scans. When you read reviews for this printer, you’ll see a lot of love but also quite a few unsatisfied customers. It seems like the Xerox Workcenter 6027 can be hit or miss. This can definitely be that high-powered workhorse you’d get at a big office at home but results may vary. The cost of toner is one potential detriment with this machine. For more similar printers, read our buying guide on the best printers for small businesses. Verdict: Although a number of people have had big problems with this printer, the Xerox Workcenter 6027 is a workhorse that is noteworthy for its strong copy and scan functionality. This is yet another compact all-in-one printer with some good features. It has multiple connectivity options, including Ethernet, USB, memory card, WiFi, and Bluetooth. You are able to print wirelessly from the cloud or even from your favorite social media account. This printer uses a 5-color individual ink system, meaning you only have to replace ink as it runs out rather than having to replace a color cartridge when just one color is used up. This printer stands out for offering excellent borderless photo printing, with crisp and vivid clarity with excellent color accuracy. The touchscreen LCD interface makes it easy to use for scanning, copying, and faxing. This printer has a 250-page memory capacity. With automatic duplex printing and front and rear paper support, this printer offers convenience and helps save you both time and money. The Canon PRINT app gives you access to some valuable bonus features to make certain types of printing easier. Verdict: With its 5-color ink system, the Canon Pixma TS8050 offers pretty good photo printing and decent quality overall. This 3-in-1 printer is only missing fax functionality, but how many people really fax these days? Although this printer supports letter-sized paper, it really shines when it comes to borderless photo printing. It has a built-in photo tray for 4×6-inch photos. It also supports other standard photo sizes like 5×7 and 8×10. To print right from your smartphone or tablet, you can use AirPrint or the HP ePrint app. The scan-to-email option makes it simple to send scanned documents right to your email. To save money on ink, you can use the HP Instant Ink system so you only pay for the ink you use. Alternatively, you can use the Amazon Dash auto-replenishment system to make sure you never risk running dry right when you need to print something important. This printer does have a quiet mode if you tend to print late at night or if you need to print in a quiet area. This mode does reduce the aural footprint but it does mean that printing takes longer. Verdict: The HP ENVY 5540 Wireless is a very capable and convenient photo printer that has some standout features. This printer has a 6-color individual ink system, ultimately saving money and leading to more impressive print quality for photos. Like a lot of inkjet printers, this goes through ink fairly quickly. Replacements cartridges cost a fair amount but the XL and XXL cartridges save money. 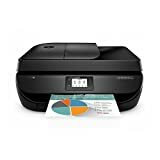 This wireless printer has several connectivity options, letting you print from the cloud or from social media. It has Ethernet and USB ports as well as a memory card slot and it supports both WiFi and Bluetooth. You can add creativity when printing photos using the touchscreen by using filters. Borderless photo impressions and print sizes supported include 4×6, 5×7, and 5×5. With inkjet printable discs, you can even print directly onto CDs, DVDs, or Blu-Ray discs. This printer has automatic duplex printing and features front and rear paper support. Available in a few different colors, it can even match your personality or design aesthetic. Verdict: The Canon TS9120 stands out for offering some of the best quality for photo printing, thanks in part to its 6-color ink system. Inkjet printers use ink while laser printers use toner. Inkjet printers tend to be less expensive and replacement ink cartridges are also less expensive than toner. That said, laser printers often have a lower cost per page when it comes to the cost of toner vs ink. The pricier laser printers also tend to offer better print quality although some inkjets definitely give laser printers a run for their money. Inkjets also tend to be more compact and are better able to handle a variety of paper sizes. Home office printer brands with the cheapest ink replenishment? Without question, Epson’s Ecotank system is significantly cheaper than other options when it comes to ink replenishment. The HP Instant Ink system can also save you money where you pay only for the ink you actually use (the pages you print) rather than paying for ink upfront. This system makes the most economic sense for those who don’t print all that much. Which is the fastest printer in this list? For B&W printing, the Brother MFCL2710DW Monochrome Laser Printer is by far the fastest. The Canon Office and Business MB2720 offers fast printing for both B&W and color. 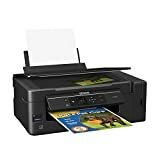 What multifunction printer has the best quality scanner? The HP ENVY 5540 offers a high-resolution scan, making it one of the best scanners here. The Xerox WorkCentre 6027 also offers a great resolution and excellent quality overall when it comes to scanning. This is a program from Amazon that allows for easier ordering based on real-world, real-time conditions. For printers that are Amazon Dash enabled, the Amazon Dash Replenishment system monitors current levels of ink or toner in the printer. When it reaches a certain level, there is an automated process where you make a purchase from Amazon and new ink arrives at your doorstep before the printer actually runs out of ink. This can be an incredibly helpful tool as it makes sure you don’t run out of ink at the worst possible moment. It’s ultimately about convenience. It saves you time and even mental energy by automating the process. A good printer can make life easier and a multifunction printer easier yet. If you print a lot, like I do, the cost of ink can get old pretty quickly. Ink efficient printers like the ones on this list can save you both money and time, resulting in less frustration. Do you have your eye on any of these printers? Let me know in the comments. Do you have any questions about printers? Ask away! I’m looking for an printer for my iPad that doesn’t come with a fax, photo, . All I want is a printer that will print off my iPad. Black and white fine. Nothing fansey. Just do a print job off iPad. I’ve owned a printer many years and that’s all I do. What’s nessessary. Help please. What’s out there.